NOAA has nine aircraft housed at an airport in Lakeland, Florida, that head toward disaster scenes to provide images to first responders, government agencies like FEMA, and the public. One of those photos led to the rescue of a trapped family. Amber Gee had evacuated from her home in Callaway, a town of about 15,000 in the Florida Panhandle with her two children last week and she assumed her relatives who lived northeast of her had done the same. 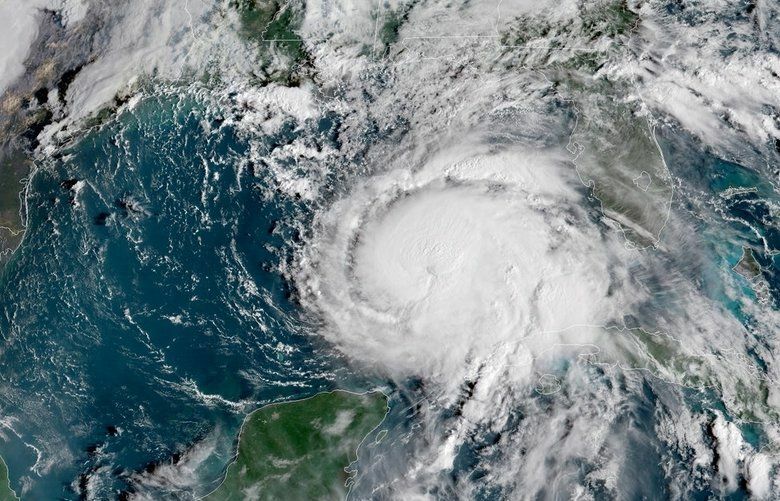 Gee learned that they were in distress after scouring a map of aerial imagery published by the National Oceanic and Atmospheric Administration that showed the severe damage from Hurricane Michael in the area. 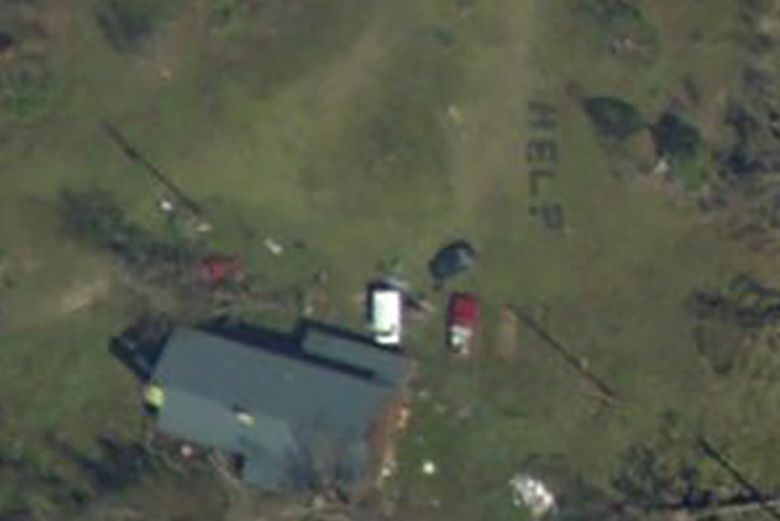 Someone had used trees felled in the storm at her grandmother’s house in Youngstown to spell out “help” in letters big enough to be seen from the sky. She later learned that her uncle, Ernest Gee, had made the message outside the home, which is owned by her grandmother, Emily Bently, Gee told ABC. While Bently had already evacuated, Ernest, his wife, and a friend had not – and they were trapped, she said. A testament to the power that digital imagery holds to provide detailed portraits of human activity on rapid time frame, and the timeless effectiveness of an old-school SOS directed at the sky, the miraculous story has been covered by media outlets across the country. The images were taken by one of NOAA’s Beechcraft King Air 350CER, a twin-engine plane manned by two pilots and a technician to work its four cameras. Though the agency has long used planes for imaging and mapping purposes, its work to provide disaster images within hours of when they strike was prompted by response to the terrorist attacks of Sept. 11, 2001, Mike Aslaksen, chief of the remote sensing division at NOAA said in an interview. Working then with film cameras, the agency took five days to get emergency responders computerized images of the area. “Some of the response community said we need the imagery within 24 hours or it’s no good,” Aslaksen said. It was first able to meet that goal after a storm in 2003. The agency now has nine aircraft housed at an airport in Lakeland, Florida, that head toward disaster scenes to provide images to first responders, government agencies like FEMA, and the public. Flooding from hurricanes has occupied much of their time in recent years; planes flew for 30 straight days to take images around Houston in the aftermath of Hurricane Harvey, Aslaksen said. The photographs allow first responders to track impacted areas, scientists to study flooding levels – a vast improvement over the process of sending teams out to map levels manually – and evacuated homeowners to check on their homes. Images of the Florida Panhandle show the destruction of the storm in towns such as Mexico Beach, and in areas further inland, carpets of downed trees. Aslaksen said the Gee family’s story was similar to an incident after Hurricane Katrina, when responders found a resident who had spelled out HELP around a home after the flooding. Gee had fled her home on Thursday, after the storm had made landfall in the area, with brutal winds and heavy rains causing catastrophic damage all around the Panhandle. After she saw the SOS, she contacted emergency officials, hoping to prompt a wellness check. Representatives from another county’s sheriff department arrived around 2 a.m. on Sunday to assist the family, ABC reported. The death toll for the Hurricane currently stands at 17, though dozens of people are still unaccounted for in the storm’s hardest hit areas in Florida. Many communities in the Panhandle still do not have cellphone service, and another 190,000 in Florida and 120,000 in Georgia do not have electricity, according to the Associated Press.